Lacey Evans is a Mae Young Classic star who's living the real American Dream. Lacey Evans commands attention from the moment she emerges at the top of the ramp. It isn't the bright red pleated skirt paired with the navy blue collared shirt that resembles a sailor's uniform. Nor is it the pin-up hairstyle or the big white flower she wears right behind her ear -- though the getup is certainly eye-catching. She ditches the skirt once she's in the ring for shorts that look better suited for the work of an actual sailor (or a wrestler). Her hair falls out of place during the match. She loses the white flower. No -- the getup is not why people are staring. They're staring because her presence is captivating. You can see it best in the face of her 4-year-old daughter, Summer, who looks up at Evans from the crowd as she waves the American flag her mom carefully placed in her tiny hands before climbing into the ring. It's the fact that Evans not only looks like Captain America, but that she puts on a performance (complete with plenty of athleticism) convincing enough that Marvel could probably go back and cast her as the All-American superhero. At 5-foot-8, with a figure built during five years of service in the U.S. Marine Corps, she'd be the perfect woman to roll up her sleeves if anyone needed a new Rosie the Riveter for an upgraded "We can do it!" poster. And the best part of it all? She has the real-life story to back it up. Before she became one of 32 women to star in the WWE's inaugural Mae Young Classic, Evans served as a military police officer with the Special Reaction Team (a specialized unit similar to SWAT), a group responsible for security at bases when they're under terrorist threats or hostage situations. Born Macey Estrella and raised in Parris Island, South Carolina, she enlisted when she was 19 years old, finishing her Bachelor's degree while still on active duty, in addition to starting her own construction business at 22. Coupled with a rising career in sports entertainment as an already-signed WWE talent, and a home life that includes a thriving marriage with a man she's been with for 13 years and a 4-year-old daughter, Evans, 27, is in many ways living the quintessential American dream. But it wasn't an easy road to success. Evans was raised in a home torn by depression and drug and alcohol abuse. She and her seven siblings were forced to live in tents at various points due to trouble with law enforcement. 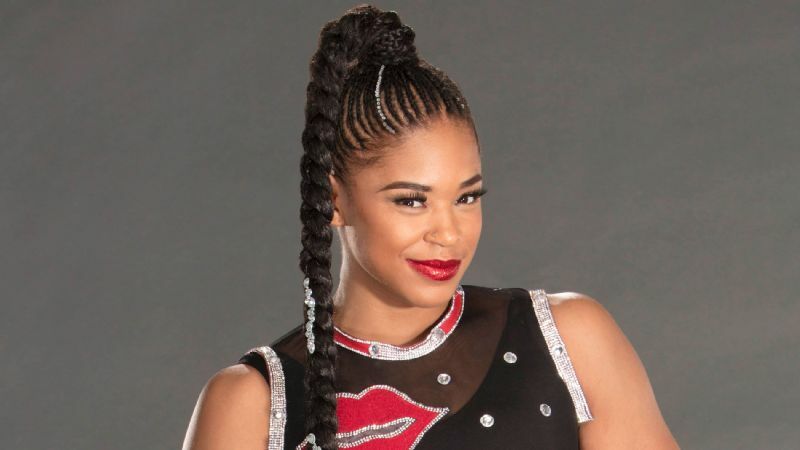 Her father, who confessed he never pursued his dream of becoming a wrestler upon learning of Evans' own ambitions, overdosed on drugs and died before Evans got her tryout with the WWE. "This is the life I saw and I knew I would never become that," Evans said. "While everyone was giving up around me, I had to make sure I didn't." So Evans took control of what she could. She focused on academics. She walked to train for wrestling in high school and was eventually crowned state champion. She started her first job at 14 years old washing dishes. She became a nursing assistant after graduating high school. Then a full-time student. Then a Marine. Then a small business owner, employing some of her siblings. Then a mother. Then a professional wrestler. "I never quit," she said. "I had to live in my car one time in this whole process and I hated every minute of it because that's what I came from. But I had to. But that was alright because I knew I could [do it]." The way she pushed through the challenge of living in her car -- during which time she cleaned up in the Walgreens parking lot and showered at the gym after working out -- is the same way she's seemingly taken on (and conquered) the challenges in her life. It's the type of discipline and self-motivation that serves her well in the wrestling business, where if you want to make it, you have to have a lot of initiative. That initiative was further refined during her time in the Marines, when she was introduced to wrestling through a staff sergeant who put shows together. He invited her to one, and at the next, she wrestled him -- a 250-pound active Marine -- in the main event. "Probably one of the hardest matches I've ever had. He was a big man," said Evans, breaking into a slight grin. "I did not win." Evans started on the independent circuit, training at American Premier Wrestling in Georgia and debuting with the promotion in 2014 before signing a WWE contract in April 2016. She has the most televised NXT experience of anyone in the Mae Young Classic. But stepping into the ring for the WWE means more to Evans than simply checking off another box on her list of goals. "Every time I get in the ring, not only do I prove to my family and motivate them to never give up -- because I'm not; I'm giving it everything I have -- but to show the world, too. I want to reach out to something so much bigger than my family. I owe that to the world," Evans said. "I do come from a broken home. Statistically, I shouldn't even be talking to you right now. But I refuse to let how I was raised dictate who I'm going to become. My motivation is to reach out to the world so they can see I'm the same person they are. "I had nothing, I come from nothing, but I am something and I will continue to be something." Now with the opportunity to compete on a whole new stage in the Mae Young Classic -- the WWE's most recent experiment in a series of standalone tournaments that have proven wildly successful for both the company and the competitors who fill the bracket -- Evans will channel the same kind of pick-yourself-up-by-the-bootstraps attitude she's employed through every turn of life's roller coaster. "I know what it's like to have to fight from the depths of life that most people will never be in," Evans said. "The way that I've been raised and the things I've had to do has given me grit that is unmatchable unless you were beside me. I don't give up; I go down fighting in everything I do -- being a mother, being a wife, being a wrestler, being a Marine, being a sister. I wouldn't want to get in the ring with me, I can promise you that."